Who will be buying the most expensive apartment or “bungalow in the sky” in Singapore? The asking price for a new three-storey Singapore penthouse, complete with a private pool on the 64th floor, has reached more than $100 million. This amount of money can well easily buy one a few good-class bungalows (GCBs) in District 9/10. The Wallich Residence’s penthouse is in the tallest building in Singapore, the island of well-heeled stability that attracts the super-rich from its less-developed South-east Asian neighbours, as well as multi-millionaires from mainland China. It will test the endurance of demand for luxury property in the city-state – the part of the market that has taken the biggest hit from measures aimed at cooling down prices in recent years. Prices for luxury homes in Singapore have fallen 15-20 % from a 2013 peak. However the recent events has cause optimism among market insiders to foresee a turnaround – at least at the top end of the market – and is forecasting a 3-5 % increase in luxury prices this year, citing demand from both locals and foreigners who feel the market is bottoming out. The volume of transactions in the first four months of the year in Singapore’s core central region was 35% higher than in the same period last year. The Core Central Region includes the popular areas among wealthy foreigners — the Orchard Road shopping area and Sentosa island. Buying by foreigners has picked up since the start of the year at the developer’s high-end Leedon Residence project, near the 150-year-old Singapore Botanic Gardens. GuocoLand is part of Malaysian conglomerate Hong Leong Group, headed by billionaire Quek Leng Chan. The recent tightening of property market controls in places like Hong Kong and Australia played a part in attracting foreign demand to Singapore’s luxury property this year. While prices in Hong Kong tripled and Sydney’s doubled over the past decade, Singapore prices rose just 29 %. City Developments (CDL), one of the largest Singapore developers, also said the average sales price at its high-end Gramercy Park project has risen to more than $2,800 per sq ft in recent months, up 8 % from a year ago, and foreign buyers accounted for three-quarters of the project so far. One may note though that the Singapore’s residential market has fallen for 15 straight quarters to log its longest losing streak since official records began in 1975. Analysts expect a bottoming of prices in the year 2017. Singapore introduced property price cooling measures to curb speculation for the past 7 years. Some measures were relaxed slightly this year but the authorities announced that there would be no more rolling back of the remaining measures for now. More information of the Penthouse can be found at the following link. As one of its overseas expansion push, City Developments (CDL) has entered into the land of the rising sun, with the acquisition of a 20 per cent stake in a residential project in one of Tokyo’s poshest areas. The move is in line with CDL’s diversification strategy to accelerate its overseas expansion. CDL bought the stake from Mitsui Fudosan Residential for a confidential sum. The 163-unit project, Park Court Aoyama The Tower, has a total gross development value of more than 50 billion yen (S$666 million). Apparently the Japan’s real estate sector, in particular within Tokyo, is experiencing a strong boom in its residential market, with robust demand for well-located condominiums. The project is in the Aoyama area within Minato ward – the centre of business activity, and home to the offices of many multinational corporations and foreign embassies.Park Court Aoyama The Tower, a 26-storey freehold development, is targeted at high-end domestic and foreign buyers. Apartment sizes range from 389 sq ft to 3,789 sq ft, and an initial 55 units will be launched for sale. Prices will start from 178.8 million yen for a one-bedroom unit, 199.4 million yen for a two-bedder and 271 million yen for a three-bedroom unit. CDL’s first partnership with its Japanese partner was in 2011 when it bought a prime site in Ginza for its flagship hotel in Japan. The site was developed into a 329-room hotel that is managed by Mitsui Fudosan Group. Park Court Aoyama The Tower is the second collaboration between CDL and Mitsui Fudosan Group in Japan. To date, CDL (including Millennium & Copthorne Hotels, and CDL Hospitality Trusts) has poured in more than 50 billion yen in 2 residential developments and 3 hotels in Tokyo. 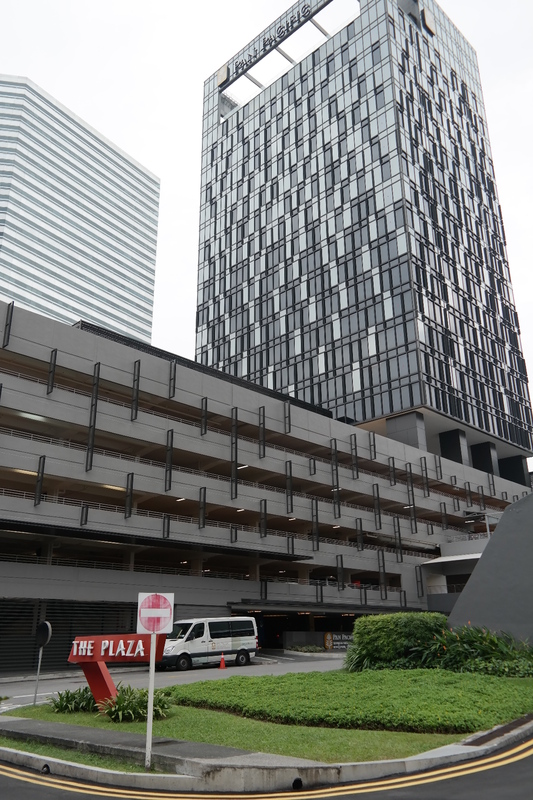 Faced with a looming November deadline to finish selling all its units in the completed Nouvel 18 condo project in a plush District 10 locale, City Developments Ltd (CDL) is racing to stitch together a profit participation securities (PPS) scheme for the project. The securitisation structure which CDL is proposing to potential investors and lenders will price Nouvel 18, which is located near the corner of Anderson Road and Ardmore Park, at around S$965 million; this translates into S$2,750 per square foot based on its saleable area of some 351,000 sq ft.
CDL gained full ownership of Summervale Properties, after buying out partner Wing Tai’s half-stake and was trying to wrap a potential securitisation deal involving Nouvel 18 and to clinch all necessary approvals before November 2016. The project received Temporary Occupation Permit (TOP) in November 2014 and Summervale has to finish selling all units in the project within two years of the TOP date, as part of government conditions on foreign housing developers (which by definition includes all listed companies). Otherwise, the developer will have to pay hefty extension charges to the state for each year of extension, pro-rated to the number of unsold units in the project. Once the proposed structure is fully in place and all the approvals given, the plan is to begin selling Nouvel 18 units in the market; the indicative target price is understood to be above S$3,000 psf. If the selling price achieved is higher than the S$2,750 psf entry level, the equity investors and the junior mezzanine bond holders (that is, CDL) will split the gains equally. If units have to be sold below S$2,750 psf, the junior mezzanine bond holders (CDL) will take the first hit of up to nearly S$300 psf loss, translating into a selling price of at least S$2,451 psf. If the selling price were to sink below S$2,450 psf, the equity investors will start to suffer a loss, according to market talk. The junior mezzanine bonds will have a longer tenor of seven years, compared to five years for the other three groups of participants in the exercise – the equity investors, the banks that will provide the 60 per cent senior debt, and the senior mezzanine bond holders. The longer tenor for the junior mezzanine bonds is seen as potentially catering for a situation where the units in the Nouvel 18 project could not be sold out within five years and refinancing is required from the banks. If the PPS is not in place, CDL will have to pay extension charges, amounting to around S$38 million (or 8 per cent of the purchase price of the site) in the first year of extension. The extension charges will escalate to S$76 million (or 16 per cent of the land purchase price) in the second year and 24 per cent of the land purchase price per annum in the third and subsequent years. The extension charges are pro-rated to the number of unsold units in the development. As the deadline for hefty penalties is approaching, various developers adopted various measures to avoid them. Some previously public listed developers chose to delist their companies from the stock market. Others had used their affliated companies to buy over unsold units. There are also some developers chose to find bulk buyers for their properties. CDL is believed to market one of the two towers at Gramercy Park which is yet to be launched. OUE is also offloading one of its towers in Twin Peaks. Gramercy Park is about 90% completed and is expected to obtain its TOP in Q2 2016. It has 174 apartments in the freehold site. CDL has until mid 2018 to sell all the units before incurring Qualifying Certificate (QC) extension charges. The asking price is believed to be around $2600 psf. For the 231-unit Tower 1 of Twin Peaks, which is a 99-year leasehold project, the TOP was obtained in Feb 2015. It has until next year to sell the unsold units before incurring QC charges. The average price of the other tower was at $2861psf. So far 72 units were sold. Many developers are giving good discounts now in the current lull market especially on the luxury segment. Individuals and funds may find this time to do property shopping at a rare opportune time. SINGAPORE developers struggling to sell apartments in their home market are buying property overseas, turning the island-state into the largest foreign investor from the region this year. Companies including City Developments and Keppel Land pumped US$2.32 billion into overseas markets in the nine months through September, a three-fold increase from the same period last year and the most in at least eight years, according to data from Real Capital Analytics, a research firm that specialises in investments in commercial property. The Singapore developers are looking abroad as government measures to rein in property values have caused residential prices to fall for four straight quarters, the longest period of declines since 2009. “Many Asian countries such as Singapore are facing property cooling measures at home, so they are venturing to Western markets where they can find returns and are seeing a strong recovery,” said Terence Tang, managing director of capital markets and investment services for Asia at Colliers International, a real estate broker. City Developments, Singapore’s second-largest developer by market value, said in September that it invested in a plot of land in Tokyo valued at S$356 million. Keppel Land, Singapore’s third-biggest developer, in July said it made its maiden investment in the US with a prime residential development in New York City. The project, which it said at the time was valued at about $70 million, is on Manhattan’s Upper East Side and will be developed by Macklowe Properties. At the same time, the developers have become increasingly vocal about the difficulties they face in Singapore, where their margins have been squeezed by falling property prices. Government measures to stem growth in the market and prevent a speculative bubble have brought residential prices down about 4 per cent from the peak in September 2013. “In Singapore, the residential market is virtually dead,” said Desmond Woon, executive director at luxury-home developer Ho Bee Land. “With the government measures in place, it has become very hard to do development of residential properties.” The government’s curbs have included a cap on debt at 60 per cent of a borrower’s income and higher stamp duties on home purchases. Additional taxes for foreigners buying residential property were raised to 15 per cent in 2013 from 10 per cent, on top of the basic buyer’s stamp duty rate of about 3 per cent. All home sellers need to pay 16 per cent in levies if they sell within the first year. CITY Developments Ltd (CDL) executive chairman Kwek Leng Beng has warned that the current subdued state of the Singapore housing market particularly in the high-end segment, if it continues, could ignite fire sales. Mr Kwek made this point in CDL’s third quarter results statement. CDL posted net earnings of S$127.21 million for the third quarter ended Sept 30, 2014, up 4.7 per cent from the same year-ago period. Revenue rose 58.3 per cent to S$1.32 billion. “The domestic residential real estate market will need to battle headwinds as sentiments remain subdued with little signs of property curbs being tweaked or removed in the near-term. Transaction volumes and prices continue to face downward pressures as homebuyers maintain a wait-and-see approach,” he lamented. The high end market, in particular, remains subdued with prices still below their 2008 peak. “Average residential rents across all market segments, particularly the high-end . . . are on the decline, coupled with a weak secondary market. “From the group’s experience, having gone through many property cycles, if this trend continues, with prices dipping more, some mortgage borrowers affected by lower rentals may have difficulty servicing their loans, possibly leading to forced fire sales,” Mr Kwek said. On a more positive note, Mr Kwek noted that savvy investors who believe in Singapore’s prospects will continue to read positively into the property market with a medium to long-term perspective. “New launches that are priced carefully will continue to sell, as buyers only need to make progressive payments based on stages of construction, and they are confident that the market will recover over time,” he added. The group can also count on two “shining stars” – the office and hotel markets. “Office and hotel properties have become most desirable assets. Demand for Grade A office space in Singapore is improving; and capital value for hotels has increased significantly, even though earnings have not caught up yet. With over 120 hotels globally, the group is able to counterbalance by geographical spread,” Mr Kwek said. In the first nine months of this year, CDL’s net earnings shrank 17.1 per cent to S$384.74 million despite revenue surging 20.3 per cent to S$2.92 billion. CDL said that the earnings drop was due to absence of significant divestment gains from non-core investment properties as compared to the corresponding period, which had accounted for gains largely from the sale of 100G Pasir Panjang and strata units in Citimac Industrial Complex, Elite Industrial Building I, Elite Industrial Building II and GB Building. “Excluding such divestment gains from YTD Sept 2013, on a like-for-like comparison, the group’s core earnings would have increased by 25.5 per cent for YTD Sept 2014,” CDL said in its results statement. Parkroyal on Pickering won big at an awards ceremony for building excellence last night, picking up the prestigious FIABCI Prix d’Excellence Gold Award. The FIABCI prize is an international award established in 1992 and given to projects outstanding in overall merit. FIABCI is the French acronym for the International Real Estate Federation founded more than 60 years ago and headquartered in Paris. Parkroyal on Pickering was the backdrop last night when FIABCI’s Singapore chapter hosted the awards ceremony for the Prix d’Excellence, combining it with the Singapore Property Awards, which honour real estate development projects or individual properties for merit in design, aesthetics, functionality, contribution to the built environment and the community at large. 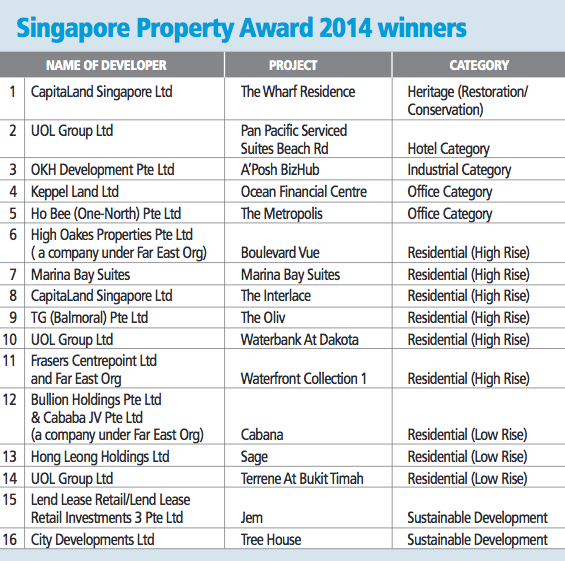 Parkroyal developer UOL also bagged three Singapore Property Awards. Among developers, City Developments Limited came in a close second with two Prix d’Excellence awards and a Singapore Property Award in the Sustainable Development category. Four Singapore projects bagged the Prix d’Excellence Award this year, while 16 out of 22 projects made the cut for the various categories of the Singapore Property Award. These 16 will go on to compete in the international competition for the Prix d’Excellence Awards next year. Lim Lan Yuan, president of FIABCI Singapore and regional president of FIABCI Asia-Pacific, said that Singapore has not been a stranger to the internationally coveted prize. “Over the past 18 years of participation in the Prix d’Excellence Awards, Singapore has won 48 awards – or one in six of the projects submitted.